sets up shop in the mouth and nasal passages of a bird and causes lesions to form that make eating acorns and berries difficult, and eventually can cause breathing to be impossible as well. One of the indicators that a bird died of trichomoniasis complications are tiny, pin-prick holes left in the bone on the inside of the nasal passages. Many, if not all, members of the dove family are susceptible to trichomonas but with varying levels of severity. Mourning Doves (Zenaida macroura) seem to suffer lower mortality rates than Band-tailed Pigeons. Rock Pigeons (Columbia livia) (the pigeon everyone is familiar with from city parks and such) is thought to have probably brought the disease to North America. Rock Pigeons are carriers of the microbe, but do not seem to die from the infections. There is concern that raptors and owls that eat birds that have Trichomonas may be affected by the disease as well, but there is relatively little data available. 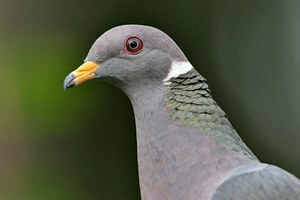 So far an estimated 5,000 to 10,000 Band-tailed Pigeons have died in this outbreak, and the count is still rising. The count is largely the result of citizen scientists finding dead birds and bringing them in to California Fish & Wildlife offices that then can carry out a necropsy on the birds to determine cause of death. 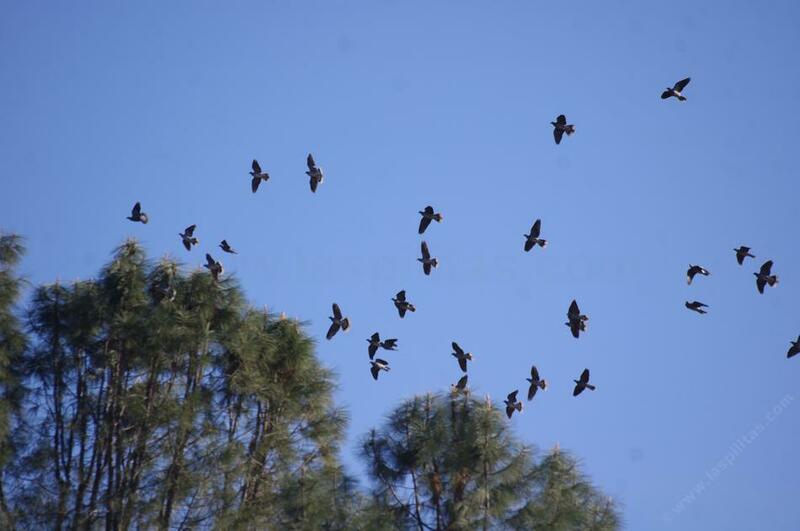 This can make estimating the total size of an outbreak difficult since birds that die far from urban areas are likely to go unnoticed and uncounted. 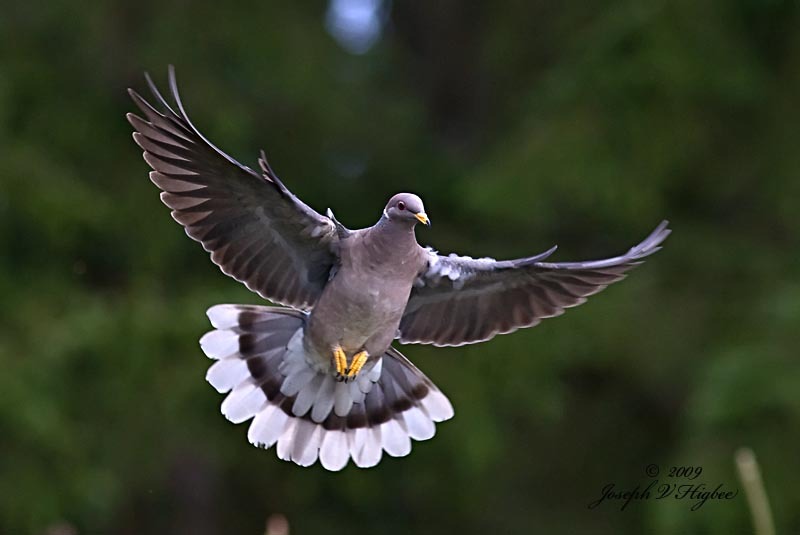 This outbreak is one of the larger ones in recent history, though a 1988 outbreak left at least 16,000 Band-tailed Pigeons dead. Outbreaks seem to be occurring more and more frequently in recent decades. This is part of a cycle that may go back millions of years. Paleontologists have examined the nasal passages of fossilized Tyrannosaurus rex skulls and about 15% show the tiny holes that are characteristic of trichomoniasis! Tyrannosaurs were distant relatives of pigeons and so may very well have been susceptible to the same, or very similar, diseases. 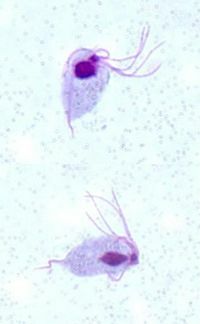 Trichomonas does not do well when it is out if a host, so the disease only spreads through pretty close association. Such associations are those found around drinking water. Birds that drink water contaminated by an infected bird that drank before them can then be infected themselves. This is one reason why more birds die in winter, when the population is concentrated in a smaller geographic area. This also may be why the outbreak this year is a more sever one since the extreme drought conditions in California are limiting the number of drinking sites available. Adult birds can infect their offspring when feeding them “pigeon milk,” the crop secretion that baby pigeons and doves consume while in the nest. So be on the lookout for dead Band-tails! You can help to monitor the extent of this outbreak. Also, reduce the chances of spreading the disease by removing standing water supplies, particularly if you have any doves or pigeons drinking from them. These measures will help curb the spread of trichomoniasis and so help to maintain the populations of our largest Pigeon. Previous Post Scholar Holler: Preston Wilson, Ph.D.
Next Post Animals have personality. Here’s why it matters.